This video doesn't feature all the latest enhancements and changes from this 3.9.0 release, but provides a great introduction to the Spring Tool Suite in general. The default STS distribution is now based on the recently released Eclipse Oxygen (4.7) release. Highlights from the Oxygen release can be found here. The latest Pivotal tc Server release 3.2.6 is now included in the STS distribution bundle. The JDT team at Eclipse provides an early access version of Java9 support from the Eclipse Marketplace. 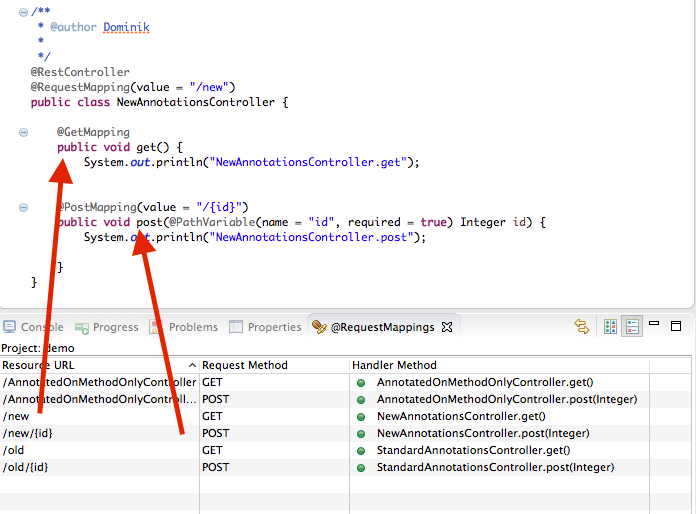 Details can be found here: Early Access Java9 support for Eclipse Oxygen. Having an early access build of JDK9 installed on your machine might cause the launcher to pick that as the JDK to run STS on - and this might fail with an error message after choosing your workspace. In that case make sure to define the latest JDK8 runtime as the VM to run your IDE on: Here is how to modify your sts.ini file for that. The content-assist retrieves values for those properties dynamically from connected Cloud Foundry targets from within the boot dashboard + the command-line interface for Cloud Foundry (in case you use that on your machine). All those Cloud Foundry targets are used only in case you are connected to them (in the boot dashboard case) or logged in (in the cf cli case). 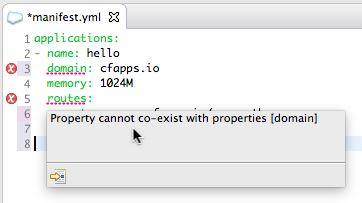 The underlying mechanics of the Cloud Foundry manifest editing support have changed in this release. Most of the features are now realized as part of a so-called language server that runs as a separate process. So don't be surprised to see another processes running on your machine whenever you have a CF manifest file open to edit. In case you updated an existing STS installation to this new version of the Spring Tool Suite, you didn't get the language server based support automatically. You would need to manually install the language server via "Install New Software", type in https://dist.springsource.com/release/TOOLS/sts4-language-servers/ and select the Cloud Foundry Manifest Editor Language Server feature. After the installation you can restart STS and will get all the new features when editing Cloud Foundry manifest files. In case something goes wrong and you would like to switch this feature off, you can go to the About dialog, select the Installation Details and uninstall the feature "Cloud Foundry Manifest Editing Language Server". 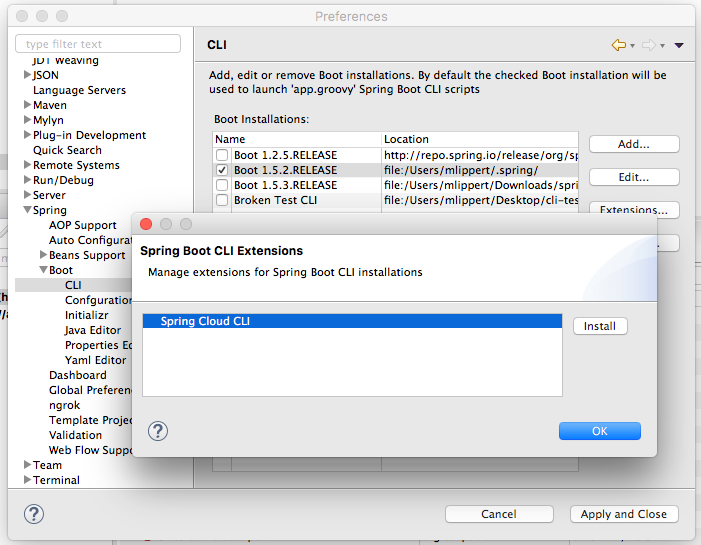 The Spring Cloud CLI extension is now automatically downloaded and installed into the default Spring Boot CLI, so you don't need to configure your Spring Boot CLI manually to use the Spring Cloud services in the boot dashboard. This happens automatically for you. In addition to that, when using a recent Spring Boot and Cloud CLI version, you get the logs of those services streamed to directly to the console view, so you can see everything that happens with from within STS. An additional improvement to the mechanics behind the scenes further reduces the number of JVM processes needed for each local Spring Cloud service that you start via the dashboard to one JVM process per started service. They show up in the RequestMapping overview as well as the Spring Explorer view. Using a few options, it is possible to run and use the Spring Tool Suite on top of a JDK9. 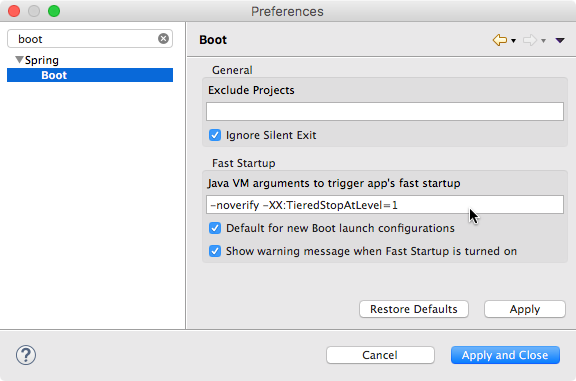 However, please notice that the Maven support in Eclipse/STS runs within the JVM of the IDE and therefore also uses the JDK9 runtime. While that isn't necessarily a problem, having Maven modules in your build that aren't compatible with Java9 might cause your project build to fail in Eclipse/STS. This is the case, for example, if you use Spring Boot 1.5.x or earlier versions, which uses an older version of the Maven jar plugin, which fails when running on top of a Java9 VM. In that case we recommend to configure Eclipse/STS to run on top of a Java8 runtime (by modifying the eclipse.ini or sts.ini file accordingyly). STS 3.9.0 requires a JDK 8 to run on top of. If you are running it with an older JDK this may not be immediatlely apparant, but some of STS functionality will simply be 'absent' because the corresponding plugins are automatically disabled by OSGI because their requirements are not satisfied at runtime. See also below 'Setting the JDK'. STS 3.9.0 requires a JDK 8 to run on top of. Nevertheless the native Eclipse launcher component might pick up a JRE or an older JDK automatically if you don't specify which JDK to run STS on top of. To avoid this, you can specify the JDK in the sts.ini file that comes with your STS installation. Add a line at the beginning "-vm" and an additional line below that which points to the "javaw" executable of the JDK on your machine. 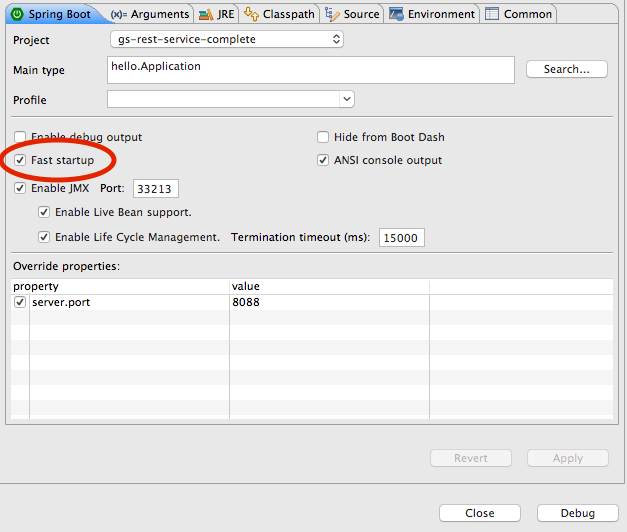 Here is a detailed explanation how to configure the JVM in the ini file.